An X-ray free-electron laser (XFEL) is an X-ray produced by a beam of free electrons that have been accelerated almost to the speed of light. XFELs produce laser beams with exceedingly high peak power intensity, which makes them attractive for applications in fundamental research, such as X-ray nonlinear optics and protein crystal structure determination, and also in medicine. It is important to precisely focus XFEL beams to achieve high performance. Lasers are typically focused using total reflection mirrors; however, conventional mirrors are unsuitable for formation of sub-10 nm X-ray beams because such mirrors cannot deliver the large numerical aperture required. To overcome this limitation, X-ray beams can be focused using multilayer mirrors. Unfortunately, it is difficult to manufacture such multilayer mirrors because very high fabrication accuracy is required. 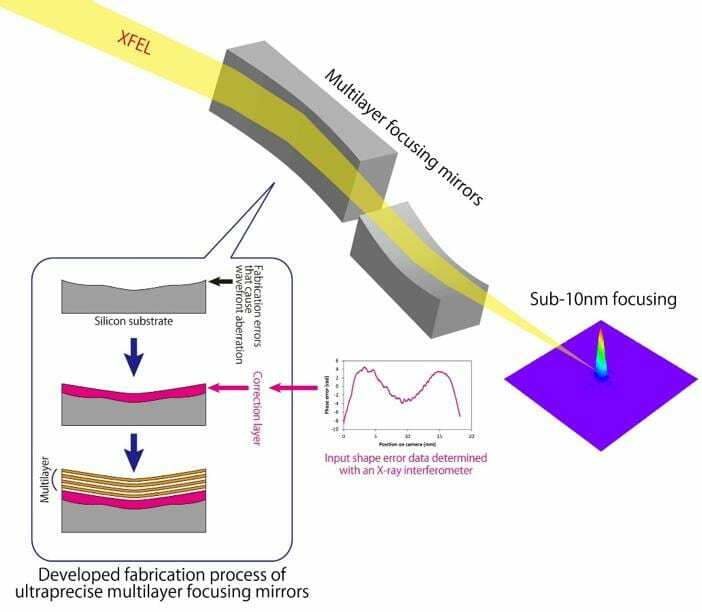 A collaboration led by Osaka University has recently developed a new technique to manufacture ultraprecise multilayer focusing mirrors with a shape accuracy of less than 1 nm, which can focus an XFEL beam to a size of less than ten nanometers. “To achieve a highly focused XFEL, we investigated wavefront determination using an X-ray single-grating interferometer and direct shape correction of the multilayer focusing mirrors by a differential deposition method,” says lead author Satoshi Matsuyama. The team first fabricated multilayer focusing mirrors by magnetron sputtering of platinum and carbon multilayers. The sputtering process was finely controlled using a one-dimensional scanning stage and computer. The fabricated multilayer mirrors were assembled into a two-stage beam-focusing system. The wavefront of an XFEL beam after passing through the beam-focusing system was then measured using a grating interferometer to determine the aberration of the wavefront from the theoretical ideal caused by deviation of the actual mirror shape from the intended design. The shape of the focusing mirrors was then corrected by differential deposition. The wavefronts before and after shape correction were compared, which revealed that the correction successfully improved the quality of the multilayer mirrors to provide XFEL beam size of less than ten nanometers. The high XFEL intensity achieved using the developed ultraprecise multilayer focusing mirrors is expected to improve the performance of state-of-the-art X-ray analyses using XFELs. The article “Nanofocusing of X-ray free-electron laser using wavefront-corrected multilayer focusing mirrors” was recently published in Scientific Reports and is available at DOI: https://doi.org/10.1038/s41598-018-35611-0. Osaka University was founded in 1931 as one of the seven imperial universities of Japan and now has expanded to one of Japan’s leading comprehensive universities. The University has now embarked on open research revolution from a position as Japan’s most innovative university and among the most innovative institutions in the world according to Reuters 2015 Top 100 Innovative Universities and the Nature Index Innovation 2017. The university’s ability to innovate from the stage of fundamental research through the creation of useful technology with economic impact stems from its broad disciplinary spectrum.